Julep Swatch Spam! Also, Candy Lacquer! 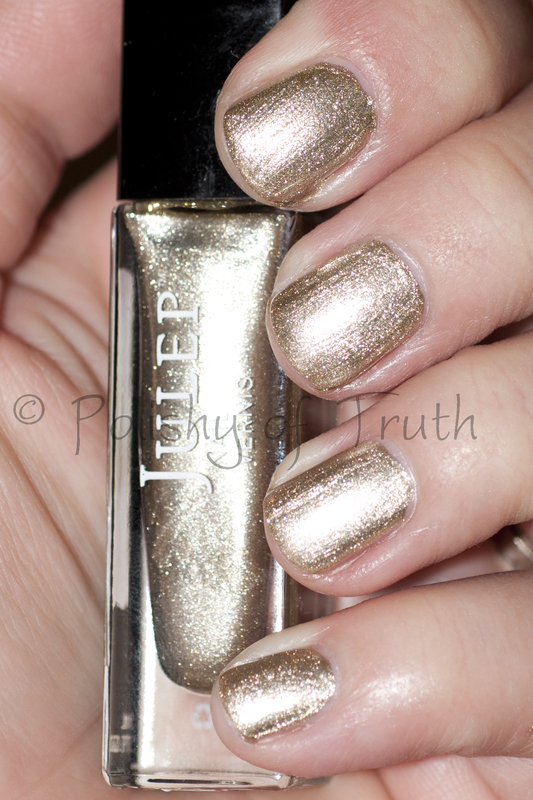 Today I have a bunch of Julep swatches to show you, just sort of in a big spammy post. Sort of like how Julep comes out with colours, eh? No real collection ;-) As much as I have been hating on Julep lately, most of these I adore. This is going to be pic-heavy, so please click through to read more! Not like a bright silver, yet not quite gunmetal, Leighton has so, so many possibilities. But look at the streaks! I may try this under something, because the shade really is lovely. This was done at night so this is with flash…I think the true shade is closer to the bottle (which is slightly out of focus in this macro shot but does not have the flash hitting it). Oh, Julep. You should do less frosty and more foil. I got Sienna with Leighton actually, in a holiday set or something. There was a 3rd one, and I cannot remember it, nor do I care to go look and see if it is still online. Anyway, the bad part of this is I got a defective bottle – it was labeled basecoat and has no balls in it! And it separates like OMFG. The good – after shaking it for what felt like 30 minutes, I got it mixed, and no bubbles! I should just find a polish I hate (like my very first Twinsie Tuesday post shade! ), drain it, and throw those balls in there. I really like this one! 2 easy coats, and even though I see a few brushstrokes here it really was not there in person. I was doing all these swatches last weekend when I was home alone, at like 1am Saturday night/Sunday morning and was having trouble with lighting. All of these shades I wore either pre-blog or close to it so I was just doing a swatchfest and then trying something new, which I will get to at the bottom, cuz you gotta save the best for last, right?!? Anyway, all that to say that this is an awesome gold foil, and I hate gold. Well not HATE, just if I am going for a replication of a precious metal in my lacquer it is usually silver or platinum. As pretty as the woman she was named after. A yummy, squishy red jelly packed with small red glitter. I almost think they may be sorta flakie but very very small. As I have mentioned before, I take photos the day/night I do my nails, but sometimes I do not get to getting the pics off my camera right away, so I forget! :) Also this is why my manis are not in the order I wear them, and not always current either (my Twinsie Tuesday post from this past week was something I think I wore in April! Or at least the VERY beginning of May!). This is very similar to Bettina’s Radiance, which the lovely Amanda from Amandalandish posted about recently, but a tad darker. This photo had flash on it, of course, so below here is a non-flash photo. It is almost darker than I think it really looked, BUT closer to the real shade. Does that even make sense? It is somewhere between these 2 I guess, but the glitter really shows through like in the first photo as opposed to this. Squishy dark red jelly = WIN! No flash. But, in person you can definitely see the glitter more! Last, but not least, Diane! Please excuse the stains, it does stain. Be careful with applying! I put Gold Nuggets over it, which is lovely gold shards/flakes suspended in a clear base. In some lights the base almost looked gold-ish, and I am not sure if it was due to the lighting, or if the colour from the shards is melting off a bit, but it definitely went on clear. Look at me with 2 golds in 1 post! It is just SO nice on, you really need to see it. Although, I realised as I am typing this up, I should have tried a jelly sandwich with this! *makes note to self to do that when I do the Diane/Dark Room comparison* I bet it’ll look awesome. Well, there you have it, some Julep love! Do you own any of these shades? Do you have any must-haves from Julep? Haha poor Leighton. It didn’t have a chance. I love the gold nuggets over Diane! Haha I know right? Honestly I was surprised when I saw the gold nuggets in my order since I am not a gold fan but I love it! Gwen and Diane are both so gorgeous!! I really like Gold Nuggets! I love Sienna it is one of my faves! Girl I can TOTALLY see you rocking this!!! The gold and red are amazing on you!!! I don’t have any Juleps but every now and again one tempts me. I’m loving Gwen and Sienna! Yeah those are probably 2 of my fave Julep’s ever! I also really like Helena but the formula is a bit of a pain. Um, wow…poor Leighton…such a good thing done all wrong. I do like the gold nuggets. They are pretty awesome…and I hate gold, too. I know right? It had such potential! Gwen and Diane are my favorites! 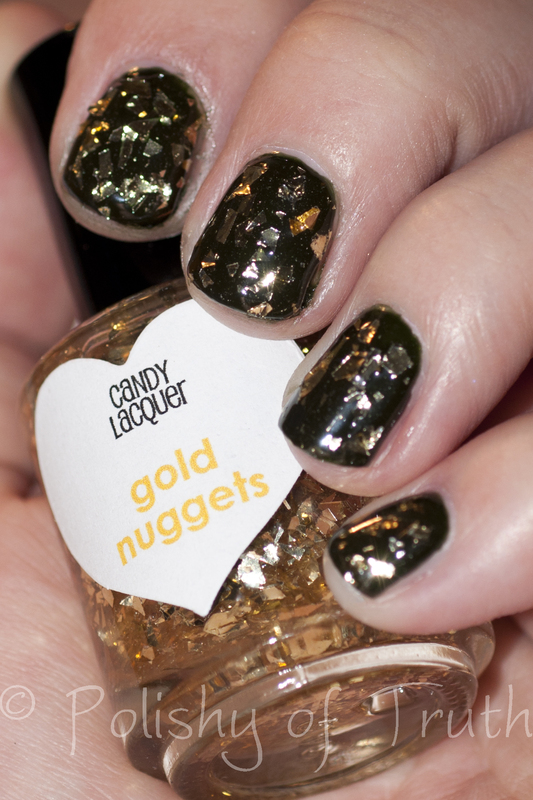 I love the gold nuggets too, but glitter with that size usually look wierd on me. I love it on you though! 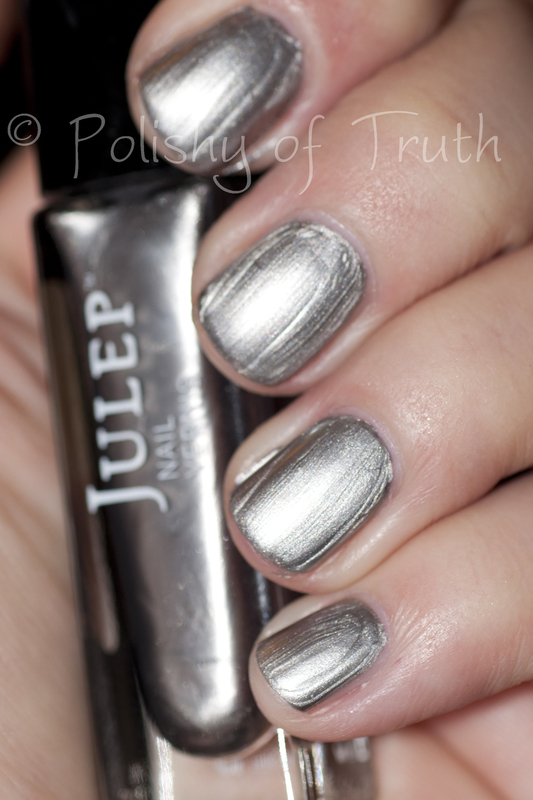 After all the crap that Julep has done, there’s no excuse for polish that’s that little and $14 to apply like that. I’d call and complain. A lot. Yeah I have complained a lot. Sadly I think this was a free set that I got for complaining already. Meh. I love it, and I am SUPER picky about my reds! I love red, but it’s gotta be a creme or jellie for me…very rarely do I like red glitter (usually at the holidays! With that said, I recently got a Lynnderella red, but I am not sure if I want to keep it! ).